Jason and I recently took a little trip to Alaska. Jason has a goal to accomplish the "Super Slam," which is to take every North American big game animal (there are 29) with his bow. There are very few hunters who have accomplished it with a gun, and even fewer with a bow. 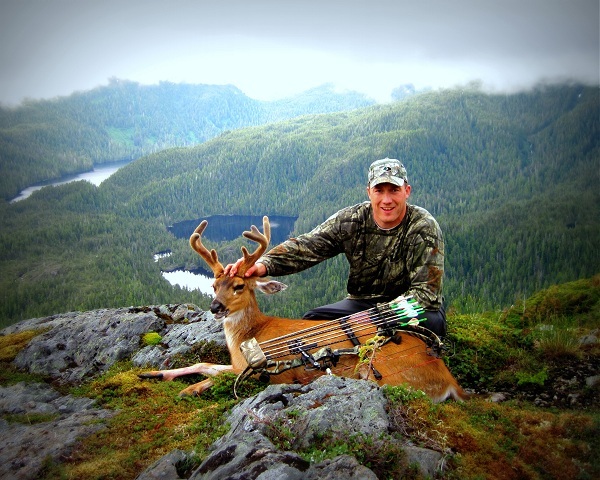 We all know that Jason loves a good challenge, so it is not surprising that he is well on his way to, how do we put it delicately, harvesting all the required critters with his bow. 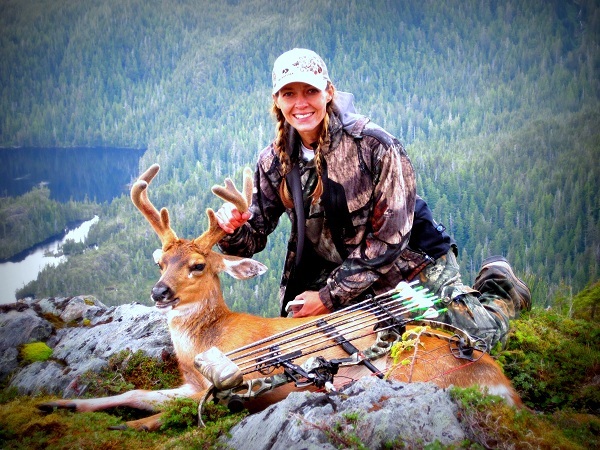 Next on the list: Sitka blacktail deer, available only in Alaska and the west coast of British Columbia. I love it when hunters say harvest. What, do they want us to think they planted the animal in the ground? Nice try. When I heard about his plans to go to Alaska, fly to an island on a little float plane and camp for a few days, I thought, why do all Jason's little hunting buddies get to have all the fun? I like fun and I don't hate nature most of the time. So I signed up for the adventure. And what an adventure it was. We flew into Ketchikan, Alaska on a Monday night, with plans to fly out to Prince of Wales Island the next morning. However, it was too windy that day to fly so we found ourselves with a day to explore the nice little town of Ketchikan. It was here that we saw our only bears of the trip. THANK HEAVENS. The only thing I was really nervous about on the trip (besides having to eat Ramen noodles) was bears. Jason chose Prince of Wales Island because there are no grizzly bears there. Only regular bears and wolves. No biggie. It was kind of bad, though, because then I had bears on the brain for the rest of the trip. I was certain we were going to come across one (or many) around every bend, under every tree, and especially during each night. Luckily, I was with Jason, who had a gun, and if that didn't work, he's bigger than me and the most logical choice for a bear's lunch. So I tried not to worry too much. Well, I can't lie, I was also nervous about flying in a tiny plane. I watched the float planes take off and land on the water in Ketchikan and I thought, holy cow. That's gonna be me. And soon it was. But as soon as we were in the air I was overwhelmed with the beauty of the ocean and the mountains. It was seriously incredible. I LOVED the flight! It was cool landing on the water. The pilot found a log to pull up to, so we stopped and unloaded all our gear, shimmying across a wet log to the shore. Adventure: begin! Pretty sure he was saying, "See you later, suckers!" as he dropped us off and paddled away, then flew back to civilization. The first thing that struck me on the island was how green everything was. Like, vibrant green. So lush and beautiful. And wet! "How amusing," I thought, "Little droplets of water just hang in the air!" Little did I know, I would never be dry again. Even the spider webs were wet. Our plan, which was carefully routed on Google Earth, was to fly into Aiken Lake (check!) and then hike a few thousand feet up to camp at a certain spot where the deer would likely be abounding. 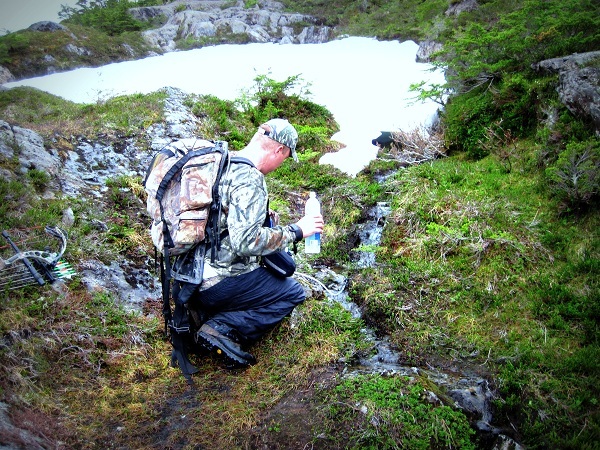 What we didn't know is that it is really hard to hike on steep, wet, mossy rocks and through thick, thick brush while trying to balance our backpacks, the two bows, rifle, tripod and everything else under the sun. We went as far as we could through the jungle, and as soon as we found a clearing we set up camp. The tent looks deceivingly large in this picture. It was actually about as high as my knee. Note to self for next time: a one man tent does not equal a one man and one woman tent. It was just big enough for the two of us to lie side by side, but not big enough to sit up fully. Gets to be awful crampy after a few days o' rain, my friend! We decided to begin hunting right away. Jason had two tags for himself and one for me (not that I would have shot anything), so he wanted to hurry and get a deer to check off his list, and then hunt for a really good one. Hiking was amazing. It was easier not having ALL our gear, but still pretty slippy. I fell a few times and had some impressive bruises. There were streams and crystal-clear lakes everywhere. Water! And hidden bears. I mean, if there are not five families of bears living under that tree, I'll give you a thousand dollars. I would get especially nervous when we would pass these strange and abundant caves because Jason was usually several yards ahead of me and I knew that I would be lunch for the bears because I was bringing up the rear. Pretty sure Jason was banking on that, even though he didn't know my secret plan of feeding him to the bears because he's bigger. I'm SO glad we were never in that situation, because how awkward would our marriage have been after that, both of us trying to shove the other toward the family of bears, then we somehow survive, and still have to spend the rest of our lives together. Awk-ward! Jason tried pretend like he didn't want me to get too far behind, but then I would look up and, oh great, he's clear up on top of that mountain! Now I have to scale the slimy thing. Right up around here somewhere we saw our first real herd of deer. Jason took a shot while I tried to video, but I wasn't sure if I was on the right deer, so he didn't shoot right when he wanted to, and once he shot and all the deer ran away we found the arrow sticking in the ground with no blood. He was sure he had hit the deer he was aiming at, so that was disappointing. We hiked in the direction the deer went, but with little hope of finding them again. Jason took a break to fill the water bladder. Can I just tell you how much I hate the word bladder, especially in reference to drinking water? Please, let us not refer to bladders when we are talking about water we will soon drink! It's so... unappetizing. We had a filter and everything, but still. I don't know if I'm made for the outdoors. Now here's one of me having a really good attitude. I vowed I would not complain on this trip, and I didn't! I was, however, silent once in a while. Now back to the chase. We followed the blood trail that I spotted and it led us to a quiet, lonely creature with a large wound. He was lying there, breathing his last. He was so cute, with great big eye lashes. I just wanted to take him home. And then I realized, oh yeah, I am taking him home. In my backpack. And then he didn't seem quite so appealing. Well, well, well, what do we have here? The mighty hunter with his Sitka Blacktail Deer. Now, if you are used to mule deer, this one must seem quite small. However, this particular brand of deer is very small, so this one is actually on the large side. I'm having two thoughts here: #1 - "Please don't let me fall off the edge of the earth," and #2 - "How long until I can wash my hands with soap?" Jason doesn't really care about washing his hands with soap, which is fortunate, because he has the fun job of... dismantling the critter. Soon the job was done, our backpacks were full ("Deep breath, deep breath, it's only meat!") and we headed back down to camp. Ah, camp. We got there right before dark. A slight drizzle was starting. The slight drizzle became more of a regular drizzle, and then a large drizzle, which continued for, oh, two days or so. Without stopping!! We had no idea how lucky we were to be able to hike and hunt on that first day, because we never again had the opportunity. The rain and fog settled in and didn't leave. Ever again. We spent most of the remainder of the time in the tent. It wasn't so bad. I had my kindle and a large bag of candy. I read five books and I was pretty much living my dreams, as long as I could keep circulation going in all of my limbs. Trying to drown my bear worries in chocolate actually worked pretty well. Jason acted tough, but I could tell he was a little nervous, too, because every so often he would say, "I'm going to shoot the rifle out the door, just in case there are any bears around." And then he would wake me in the night and say, "I'm just going to shout for bears for a minute. They don't like that." Then he'd start yelling at the top of his lungs in a really mean voice, "Get away bears! Get out of here! Shoo!" and I would think, "Oh man, we are doomed." But either it worked, or the bears really were down fishing for salmon at the lower elevations like they were supposed to be at this time of year. Occasionally we had to leave the tent to get water, and we tried to go hiking a few times, but it was just too wet. We were supposed to leave the island on Sunday. Let's see, if you do the math, we shot the deer on Wednesday, that's an awful lot of time to spend in a tiny wet tent! So we called on the satellite phone to see if the pilot could come get us a day early. He said he would try. Saturday morning we packed up all our sopping wet things and slid down to the lake to wait for our rescue. The sky wasn't looking so hot. Jason tried to fish for a while, but there were no fish to be caught. At 9:30 am, we heard a plane approaching. We heard it fly around for a long time. And then we heard it leave. I was sure we were destined to stay on this island forever. It really felt like we were on LOST, but with no fruit to sustain us. Just meat. And we all know how I hate to meet my meat. We waited and waited and finally at about 3 pm we heard... a plane! The sky didn't seem any clearer, but suddenly, there was Dave! Bursting through the clouds and headed straight for us! He's probably never received such a warm welcome in his life. Then again, he's a bush pilot in Alaska... he probably has. Do I look happy? Because I am. It was a pretty clear day once we got past Aiken Lake. I know why they call it that. Because if you aren't achin' when you get there, you will be by the time you leave. Alaska is just breath taking. Most of the time I couldn't believe what I was seeing. And the nature! It just goes on and on and on. You can't get away from it! It looks especially great from a plane after four days on a blessed little island. Don't get me wrong. Jason and I had a great time. The weather took us by surprise, for sure, but we had a lot of laughs and I'm so glad I got to experience all the craziness with him. I told Jason in the beginning that I just wanted to read and sleep on this trip, and man, did that ever come true! 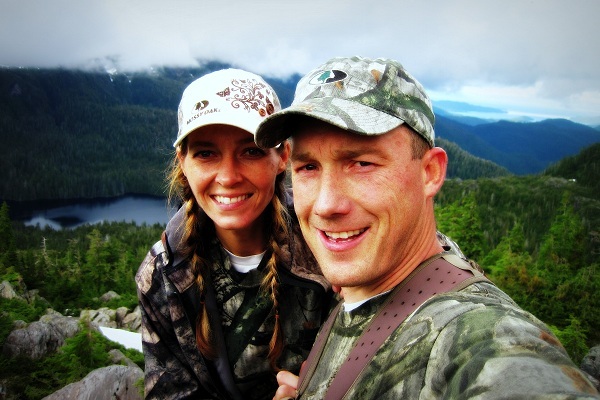 But we were also blessed with the hike of a lifetime, and a hunt we will never forget. I'm just glad we finally got to leave, because a few too many days in the rain tends to make a person... slightly crazy. Take my word for it. Finally! I've so been looking forward to this! Laughed out loud more than once. Glad you made back alive, Anne Marie. (Also, happy to learn you ultimately didn't have to sacrifice Jason to the bears.) Great post! I loved it once again! What an adventure! Beautiful pictures, I'll tell you i'm a little jealous, not about the tent but the scenery! I felt kind of sad for the deer being posed in different ways to get the perfect picture;) He was dead by then right? Glad you got to go. You guys are the coolest people ever! I can't wait to tell all my friends about how my cousins got dropped off in the middle of nowhere island Alaska and had to survive off the land. BEST POST! LOLOLOLOL!!! my fav part was when you talking about how awkward your marriage would be after you each shove each other at the bear! HILARIOUS! What a trip of a lifetime. Could you see Russia from where you were? ;) Glad you made it back without becoming dinner. This is such an amazing post! What awesome pictures and what an experience!! Did Jason mount the head? How is he doing on his grand slam?